How a bootcamp nurtured entrepreneurialism in healthcare professionals and supported their long-term development as innovators. We often think of “innovators” as individual pioneers, forging ahead alone to find new ways of working. But in reality, their interactions with other practitioners are a vital source of inspiration, driving the formation and execution of new ideas. While peer learning communities can be a valuable source of these interactions, they are only as effective as their design. Many organizations set out to create networks (often centered around in-person convenings), and many struggle to work with participants in a way that generates fruitful and sustainable engagement. In 2015, the Private Sector Health Alliance of Nigeria (PHN) set out to foster a community of health innovators. They sought to develop this community through a series of programs, including a competition to discover the most promising actors in Nigeria. PHN engaged Reboot and FATE Foundation to design a bootcamp for building the entrepreneurial capacities of competition frontrunners. Reboot and FATE Foundation designed “The Health Innovation Challenge Bootcamp” to cultivate the problem-solving capacities of participants, as well as encourage trusted relationships between them, for future collaboration. PHN is Nigeria’s leading platform for improving health outcomes through the private sector. Through an online marketplace launched in 2014, the parastatal organization began building a broad portfolio of initiatives that would showcase and support local innovators. Their flagship Health Innovation Challenge drew wide interest from healthcare professionals, social impact entrepreneurs, and technologists. Before selecting challenge finalists, PHN decided to bring 40 of the most promising applicants together for the Health Innovation Challenge Bootcamp. 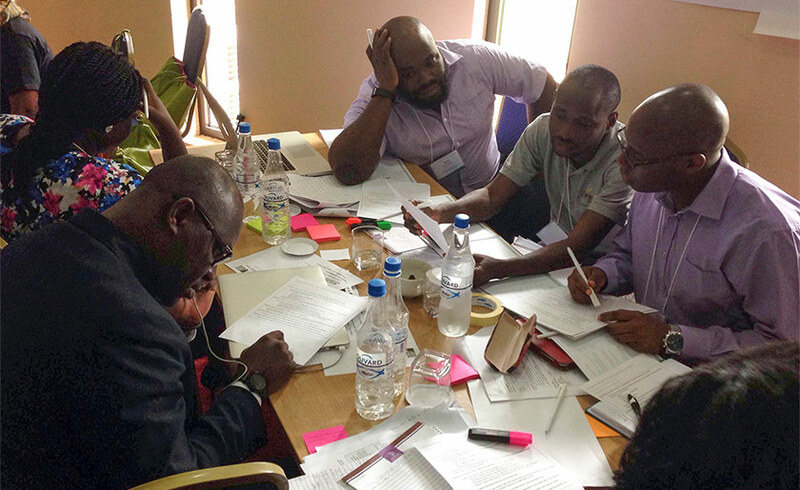 PHN envisioned that this week-long program would support participants in their immediate work, feed back into PHN’s understanding of innovation, and lead the way toward a sustained community of practice focusing on health innovation in Nigeria. To achieve this ambitious agenda, PHN engaged Reboot as well as FATE Foundation, a Lagos-based non-profit with entrepreneurial training expertise. Together, we co-created four objectives for bootcamp participants: 1) To develop their overall problem-solving capabilities through an introduction to design thinking; 2) To develop their business communications and operations skills; 3) To hone their domain knowledge and offer applications of it in the private sector; and 4) To engage them as active members of a nascent community. With a full week carved out for everyone to gather, this was a huge opportunity, especially for the crucial relationship-building stage of an emerging community. From the early stages of planning, Reboot served as PHN’s thought partners to shape its vision for the bootcamp into concrete and manageable objectives. We then co-created a curriculum targeted directly to those objectives. This strategic advisory work helped PHN navigate the enormous possibilities of “innovation” and home in on the best possible outcomes within the given constraints of available time and resources. Before co-creating workshop design and principles, Reboot conducted design research with a sample of the participants to understand their challenges, goals, and motivations. This thoughtful preparation was key to success, ensuring the curriculum spoke directly to participant needs. It also supported facilitation, keeping the energy high through a long week, challenging people to think differently, and creating the comfortable space necessary for participants to build lasting relationships with each other. Reboot led the design and production of all curriculum materials. These included hard copies of information guides for participating innovators to use throughout the bootcamp, and for expert review panelists to offer constructive assessments of innovators’ work. We also created a digital toolkit for participants to take home on a flash drive. This enthusiasm manifested in commitments to continue building community beyond the workshop. Participants volunteered to start and manage an email newsletter and to organize biannual in-person meet-ups, laying the groundwork for PHN’s ongoing community building. PHN has moved 12 of the challenge finalists forward into an accelerator stage for an 18-month-long program to continue the peer learning work and provide investment. Reboot has also helped to shape this stage: We facilitated internal reflection workshops with the PHN team to capture a new set of tools and principles from the bootcamp, which can support not only PHN’s internal work but disseminate learnings with the broader innovation community. With its unique mission to spur public health innovation through private investment, and a new set of tools and principles developed through this intensive bootcamp, PHN is well-positioned to continue supporting the transformation of the health landscape in Nigeria.